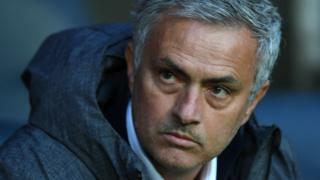 Manchester United manager José Mourinho is innocent of tax fraud and had his tax affairs ratified by the Spanish government, according to his advisers. Mr Mourinho has been accused of two counts of tax fraud - €1.6m in 2011 and €1.7m in 2012. The Madrid prosecutor said the case was presented to a local court. Other prominent football figures have been accused of tax fraud in Spain in recent months. Real Madrid forward Cristiano Ronaldo, who played under Mr Mourinho and shares the same agent, is accused of defrauding tax authorities of €14.7m, by also hiding his income from image rights. He denies the accusations and is threatening to leave Spain. The Portugal international is set to give evidence in his case on 31 July. Image caption Mr Mourinho's advisers published this document from the Spanish tax authorities which they say "attested that he... was in compliance with all tax obligations"
José Mourinho would join a growing list of football stars being investigated and prosecuted in Spain over accusations of tax evasion, in particular in connection with allegedly undeclared income from the sale of image rights by using companies based outside the country. In this way, Lionel Messi has been found guilty of fraud, and Cristiano Ronaldo accused by prosecutors of evading €14.7m. Cristiano Ronaldo and José Mourinho are both clients of the football agent Jorge Mendes. Other Mendes charges being investigated for alleged tax evasion while playing in La Liga include Ricardo Carvalho, Ángel Di Maria and Radamel Falcao. All are accused of using a similar system, whereby their image rights were owned by companies registered in the British Virgin Islands or Panama, and which allegedly received money from intermediaries based in Ireland. A statement released by Mr Mendes' company Gestifute last week, countering reports that he was being investigated alongside Radamel Falcao, said that the Portuguese agent did "not participate or offer any services related directly or indirectly with financial, tax or legal consulting for his clients".